At Fralin Pickups, we believe the best sound comes from the the highest quality materials available, not fancy gimmicks. That’s why we use USA-Made materials and wind our pickups by hand, one at a time in Richmond, VA. We know you’ll love our Jazz Bass Pickups. Fralin Jazz Bass Pickups are fat, loud, punchy, and clear. They have articulation and definition not found in other manufacturers pickups. We use all USA-Made parts, and wind and build them one at a time by hand, the Fralin Jazz Bass is a clear choice. 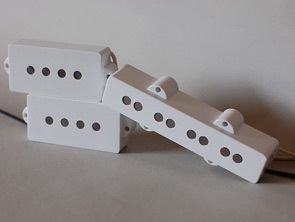 Choose this option if you want raised centre pole piece magnets on your bridge. This helps with string balance on fingerboards with a radius of less than 9.5 inches. Do not choose this option if you have a flat fingerboard. GIVE YOUR JAZZ BASS A FACELIFT. ■Era-Authentic tone from the 60’s. ■For a thicker midrange and less highs, choose +5%. This will reduce the highs by 5%, and increase the lows and mids by 5%. ■For an even thicker tone than the +5%, you can opt for +10%. This is perfect for anyone looking for an aggressively strong midrange and dark tone. Perfect for balancing out a bright sounding bass. ■If you’re looking for a little cleaner tone, use our -5% wind. This will increase the highs by 5%, and decrease the mids by 5%. 1.What output do I choose? Good question. For the most balanced tone between highs and lows, go to the Stock Output, which is a replica of the earliest Jazz Basses. If you’re looking for a thicker and darker tone, opt for the +5% Output. If you’re looking for a cleaner and more articulate sound, opt for the -5% output. 2.What does “Raised Centres” mean? This all refers to your fingerboard radius. If you have a Vintage radius (7.25″ – 9″), you might want to go with Raised Centres. If you have a flatter radius, keep it stock. 3.What Pots should I use? 250K. 4.How do I orient the pickup? The leads come out of the treble side. 5.Do you have Foam or Mounting Plates? As it turns out we don’t. You can use the styrofoam wrap the pickup was shipped in to mount the pickup – we use that all the time. A loud, clear and even response to four string bass players with no hum. This bass pickup allows you to get all of the Jazz-Bass vibe that you love, minus the hum. Being a hum-cancelling Jazz Bass pickup, it’s fat, thick, and a little thicker sounding than a single-coil Jazz Bass. AUTHENTIC 60’S JAZZ BASS TONE, NO HUM. Our Split Jazz Bass Pickups feature USA-Made magnets and wire, and are wound by hand, one at a time. Featuring a Left-Right Coil design for no-hum, we guarantee that you will absolutely love the sound of our Split Jazz Bass Pickups. We wind these pickups to 60’s specifications, using top-of the line materials to give you a clear, open tone: all across the board. ■Era-Authentic tone from the 60’s with no hum. 2.What does “Raised Centers” mean? This all refers to your fingerboard radius. If you have a Vintage radius (7.25″ – 9″), you might want to go with Raised Centers. If you have a flatter radius, keep it stock. 1.What output do I choose? Good question. For the most balanced tone between highs and lows, go to the Stock Output, which is a replica of the earliest P-Basses. If you’re looking for a thicker and darker tone, opt for the +5% Output. If you’re looking for a cleaner and more articulate sound, opt for the -5% output. 2.How do I orient the pickup? We always recommend installing with the Black Lead coming out of the treble side. 3.Do you have Foam or Mounting Plates? As it turns out we don’t. You can use the styrofoam wrap the pickup was shipped in to mount the pickup – we use that all the time. Loud, clear and sweet. This is a great single-coil tone replacement for 50’s and reissues. With AlNiCo V USA-Made Magnets and wire, the Fralin ’51 P-Bass is great for those looking to add more definition, clarity, and extended low-end to their ’50’s bass. Great single coil tone replacement for 50's and re-issues. Stock wind is 6.5K but can be wound from 6k-8k. Also available in "Split" version for hum- cancelling. ADDED ARTICULATION, DEFINITION, AND BASS. Since it’s creation, the P-Bass has been a bass icon. 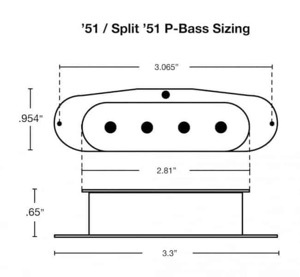 Known for it’s classic, deep, and fat low-end, the ’51 P-Bass is arguably the bass that started the classic bass tone. At Fralin Pickups, we take what you love and give it steroids. 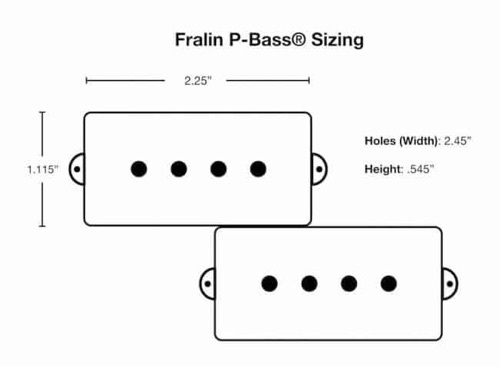 By paying attention to the smallest details and using the highest quality materials, our ’51 P-Bass Replacements still have the classic tone, with enhanced lows, clear highs, and all the definition and clarity you’ve come to love and expect from Fralin Pickups. The Fralin Pickups ’51 P-Bass replacement sounds extremely clear, articulate, and deep. With the highest quality materials we can get our hands on, you’ll be impressed with the enhanced definition that our pickup will give your bass. The Fralin ’51 P-Bass replacement will sound bright without sounding tinny or harsh. The low-end will sound deep, rich, and fat – without sounding muddy. We’ve taken care to make sure that we enhance the most important aspects of your bass: the bass. We guarantee that you’ll love your P-Bass even more after putting in the Fralin ’51 P-Bass pickup. 2.Why is the A string the tallest? That’s the way Fender did them back in the day. You can certainly request a custom stagger, if you’d like. Just use the “Notes Field” on the checkout screen. 3.Will this pickup fit my bass? We don’t know! Definitely check below under “Sizing Information” for our size. You’ll want to double check for sure. Our Lindy Fralin Split ’51 P-Bass is a great single-coil tone replacement for 50’s and reissues. Loud and clear, with no hum. Using USA-Made parts and made by hand, our pickups sound leaps and bounds better than the stock pickups. This is the Hum-Cancelling version of our ’51 P-Bass. SWEET 50’S P-BASS TONE, NO HUM. Our combination of authentic 50’s P-Bass tone and a Left-Right Coil Design give you killer tone, with no hum! With no modification necessary, the Fralin Split ’51 will drop right in to your era-authentic bass or re-issue with ease. This pickup will fatten up your bass up a bit, too. The Fralin Split ’51 is our hum-cancelling version of our Fralin ’51 P-Bass Pickup. Warm, rich, full, with no hum. The top end is warm and round, the the low end is extremely full, deep, and rich. The Fralin Split ’51 is the perfect pickup for those who want era-authentic 50’s P-Bass tone with an added hint The low end is extended deeper than before – with some AlNiCo V sweetness added to it. By adding a second coil, we were able to achieve a completely silent operation, with a hint of fatness added to it. The “pushed-in-by-hand” AlNiCo V Magnets are just part of the equation that gives this pickup such a smooth tone. 1.What’s the difference between this model and the Stock ’51 P-Bass? No hum! Tonally, they are very similar, with this model being slightly fatter and darker. It’s subtle. 2.What output do I choose? Good question. For the most balanced tone between highs and lows, go to the Stock Output, which is a replica of the earliest P-Basses. If you’re looking for a thicker and darker tone, opt for the +5% Output. If you’re looking for a cleaner and more articulate sound, opt for the -5% output. 3.Why is the A string the tallest? That’s the way Fender did them back in the day. You can certainly request a custom stagger, if you’d like. Just use the “Notes Field” on the checkout screen. 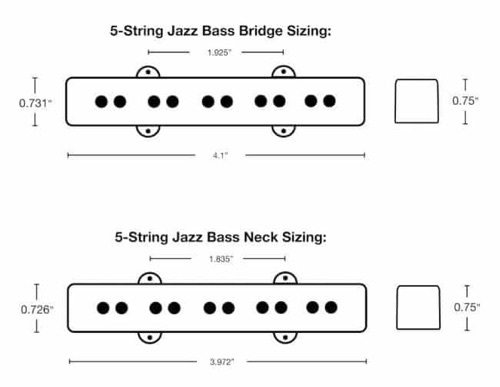 4.Will this pickup fit my bass? We don’t know! Definitely check below under “Sizing Information” for our size. You’ll want to double check for sure. The Fralin P-J Set is the ultimate replacement for any P-J Configured Bass. It utilises our Stock P-Bass Pickups along with our Split Jazz Bridge to give you an amazing, noiseless tone in all positions. 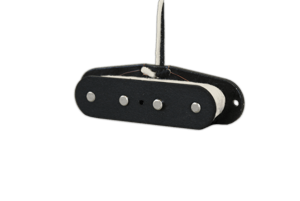 The Fralin P-J Set is comprised of our full-sounding P-Bass Neck pickup, and our noiseless and rich Split Jazz Bridge. You’re guaranteed a 100% noiseless, fat and rich tone in all positions. Our Split Jazz Bridge utilises our legendary Left-Right coil design that avoids the “lifelessness” found in stacked coils. Combined with our full-range neck, your jaw is guaranteed to drop. ■USA-Made Parts, and Wound By Hand, One at a Time. The Fralin P-J Set is the best sounding P-J Pickup Set you can buy. With AlNiCo V magnets and USA-Made wire, you’ll be astounded by the range of these bass pickups. Fralin Pickups are known for their deep, rich lows and top end sparkle – all across a warm and fat midrange. 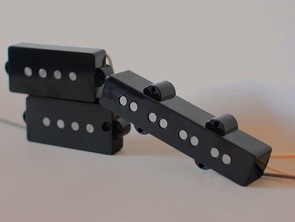 You’ll be amazed by the articulation and clarity our pickups will give your bass. The Fralin P-J Set will breathe life into your bass, by extending it’s range and compressing it slightly while remaining extremely dynamic. 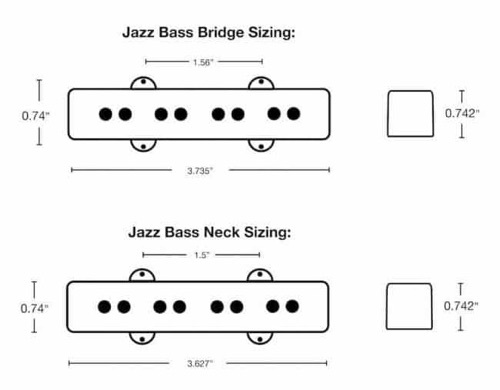 The Split Jazz Bridge is overwound by 5% to give an even volume across all pickups. 1.What’s the difference between the Split Jazz and Normal Jazz Bass? The Split Jazz is a little thicker and darker sounding, with a tad bit more output. 2.Can I customise any of the outputs? Sure! Just request them in the Notes field on the checkout screen. 3.How do I orient the pickups? We always recommend installing with the Black Lead coming out of the treble side. 4.Help! I installed them, and they are out of phase! No problem. Just reverse one of the pickups’ leads in the control cavity (swap White and Black). “About fifteen years ago, a guitarist named Lindy Fralin dropped some Seymour Duncan replacement pickups in his Strat (™). Intrigued by the change in sound, he began to investigate the art of pickup making. Thanks to a friend who had a spool of copper wire and a pickup winder powered by the motor from a dentist's drill, Fralin started to wind vintage style pickups. Before long, he had his own winder and was devoting much of his free time to trial and error experiments. " It took me about five years to get a pickup I liked," Lindy says, "but I kept at it. 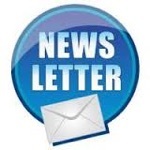 Eventually, I was making pickups for some of my friends, and it slowly grew into a business from there." 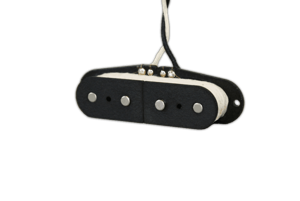 Today, Fralin's shop specializes in vintage reproduction pickups and coil rewinding. Most of the pickups he makes are for guitars, but Lindy recently added Jazz Bass(™) pickups to his line. We tried out a pair in our trusty old '65 Jazz Bass, doing before and after listening tests in the Bass Player sound lab. Fralin always asks for customer input before making or rewinding a pickup, but all we told him was that we wanted the classic tone of a vintage Jazz Bass. He sent us a pair of his pickups along with a note that said they were "made just like early 60's Fenders(™)...(and) handwound as loud as we can make them without losing clarity or high end." We got the Jazz Bass ready for our test by slapping on a fresh set of Trace Elliot stainless steel round wounds (.040-.100) and plugging it into our reference rig with everything set flat. The original pickups, while exhibiting plenty of punch and growl for which Jazz Basses are noted, left something to be desired in the low end, requiring an EQ boost to round out the sound. And they were microphonic. With the Fralin pickups, the change in the tone of the bass was striking--and entirely positive. The Fralin's had all of the mid-range punch of the stock set, but they provided considerably more warmth on the bottom, more clarity and "sparkle" in the high end, and more output. They were evenly balanced across the strings---and they weren't microphonic. In short, with the Fralin pickups the '65 Jazz Bass retained it's vintage character but became even more lively and musical.